Ceanothus L. is a genus of about 50–60 species of shrubs or small trees in the family Rhamnaceae. Common names for members of this genus are California Lilac, Wild Lilac, and Soap Bush. "Ceanothus" comes from a Greek word meaning "spiny plant". The genus is confined to North America, with the centre of its distribution in California. Some species (e.g. C. americanus) are found in the eastern United States and southeast Canada, and others (e.g. C. coeruleus) extend as far south as Guatemala. Most are shrubs 0.5–3 m tall, but C. arboreus and C. thyrsiflorus, both from California, can be small trees up to 6–7 m tall. The species illustrated here is Ceanothus thyrsiflorus (also known as blueblossom or blue blossom ceanothus), which is an evergreen shrub in the genus Ceanothus that is endemic to California. 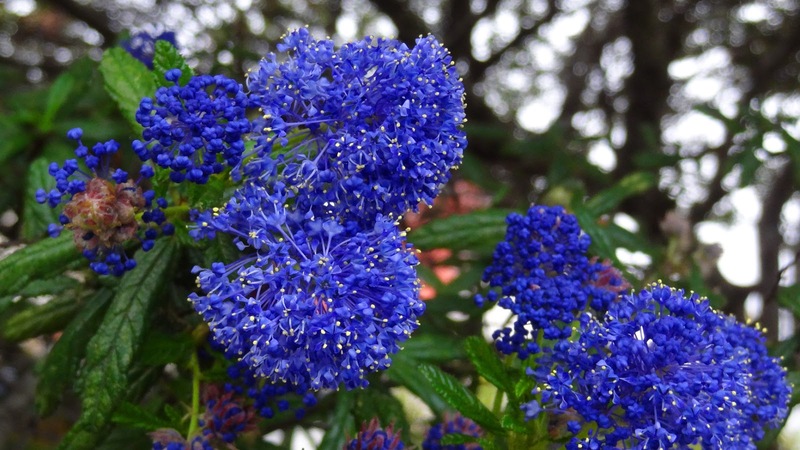 The term 'Californian lilac' is also applied to this and other varieties of Ceanothus, though it is not closely related to Syringa, the true lilac. In late spring and early summer, this bushy evergreen shrub is smothered in clusters of of dark blue flowers among small, dark green, glossy leaves. It looks great in the middle of a south or west-facing mixed border, or as a specimen at the edge of a terrace or path. It requires protection from cold, drying winds. Each year, after the plant has flowered, take out dead, diseased or damaged shoots and trim back the flowered shoots to the required shape. Apply a 5-7cm mulch of well-rotted organic matter around the base of the plant in spring. A wonderful blue with the bright dots. What a beautiful blue color! Blue, blue, blue.. what a beautiful color!! Have a nice weekend, dear nick! what a wonderful intensive color! the colour is so striking! Wow ! What a beautiful plant !!! FFF304 - CINERARIAS FOR SPRING!